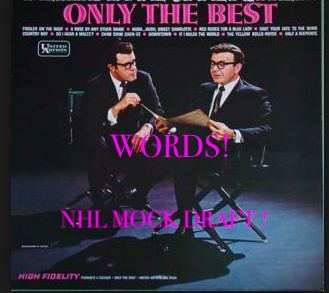 Welcome to “ONLY the Best Words”, a new Sports Dump feature where we take an existing piece of work that you would never read and present it in a more digestible, entertaining (and far less fact based) package. I offer the following alternative version, using about 1000 less words, with completely fictional scouting reports stitched together from the original article. All words used in this piece appear in the original article although almost never in the same order. Dach has the potential to be a two. Out of six. He can marinate beef with no tools. Intriguing. The Coyotes can power up this killer with bolts of explosive blue lightning. He has a tremendous Vlasic Pool. He has a lack of size, creativity, tenacity, skill and athleticism. Also skating. The Habs nab a have not. Teams sure won’t want to get the hands of this prospect in their pipeline. Robertson has been highly regarded for his punch and could be a threat to the team. Big guy who can dose the goalie with speed. His offensive stick continues to rise when he can imagine a two-way slot with tremendous depth. I think shooting Robertson would be a reasonable consolation prize.